Michael Goulian was the headline act at the 2009 Thunder on the Lakeshore airshow at Manitowoc (WI). He generously offered to fly an air-to-air session using his Cessna 182 support plane. 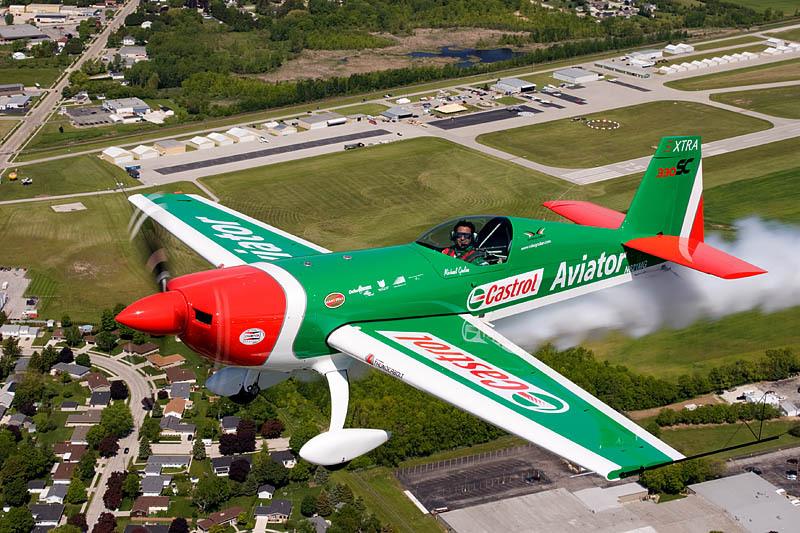 It was an awesome shoot because Matt Chapman (an excellent airshow performer) was flying the photo-plane. There were a couple of times I had to ask Michael to move out a little bit because the shadow of the Cessna's wing was on his plane, or I needed to use such a wide-angle lens that I was getting part of the Cessna in the edge of the frame. This is one of my favorite shots from that shoot. The Manitowoc Airport is in the background.